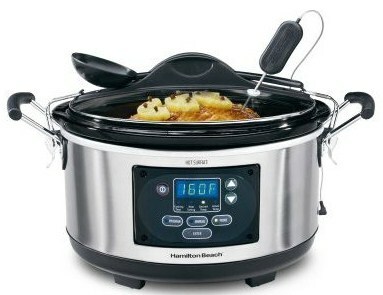 You can be the winner of this amazing kitchen appliance: The Hamilton Beach-Set n’ Forget 6 quart Programmable Slow Cooker with Lid, Click-in-Spoon, and thermometer probe. 1. To enter the giveaway, just leave me a comment on this post using your name & a real email address (in case you win). 3. Share on Facebook about this giveaway using: “Win a Hamilton Beach Slow Cooker & Cookbook or KitchenArt Spice Carousel on http://www.cookeatdelicious.com” and leave a separate comment saying you have done so. 5. Tweet about this giveaway using: “Win a Hamilton Beach Slow Cooker & Cookbook or KitchenArt Spice Carousel on http://www.cookeatdelicious.com” and leave a separate comment saying you have done so. That is 5 chances to win! Two comments will be randomly chosen on a number generator for the first & second place giveaway prizes. Make sure to leave separate comments as each comment is a separate entry. This is a worldwide giveaway. This giveaway runs until Wednesday, November 30th, 2011. One whole month of celebrating! So start your commenting now!